This is just a sampling of what we had. Now, my mom also had a bowl of fresh fruit available, and we ate a green salad with Good Season’s dressing several times a week. At the same time, we had lots of canned veggies. In fact, not until I was an adult did I realize that a yam was actually a sweet potato and cranberry sauce could be made in a way that did not require a can opener. This is not to say that my mom was a rotten or lazy cook. On the contrary, she was a good ole Southern mama from Frankfort, Kentucky, which made her an expert in gravy and biscuits. Like any decent Southerner, she used bacon as flavoring for any vegetable (e.g., beans and bacon, black-eyed peas and bacon). Most dinners were made from scratch. 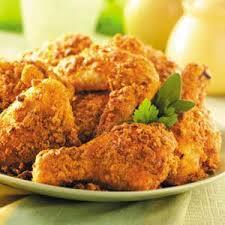 My favorite meal was her fried chicken made with white flour, spices and cooked in a fryer full of Crisco oil. Even though the chicken was not processed, it was not healthy, primarily because it had too much fat per serving, and Mama served the food with lots of white starch. Nonetheless, my mother was no different from the other moms in the neighborhood. My pantry inventory reflected the times in which we lived. This was the culture. It was a “white world”: white lard, white bread, white rice, white potatoes, and lots of white sugar. It was also a packaged world: brownies in a box, scalloped potatoes, Hamburger Helper and Kraft Mac and Cheese. I never remember eating brown rice, whole-wheat pasta, or a couscous. And, I don’t think my mother once bought a bottle of olive oil until I was already away at college. The pendulum swing back to whole foods had not yet begun. At the time, anyone who was a self-proclaimed vegetarian was labeled a hippie or health nut. My friends and I had a hard time trusting someone who didn’t get into a thick juicy steak. That was just un-American. This might be the reason we are 37th in life expectancy globally around the world (Warner, 2013). 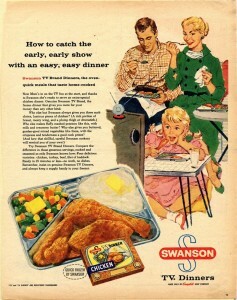 Back then, my plate looked quite different from what a nutritionist would recommend today. Half the plate consisted of some type of protein (usually fried or baked in butter). 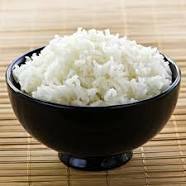 One-fourth contained a starch, usually white rice, white potatoes, or white pasta. The other fourth would be a vegetable of some sort—either a green salad or canned green beans or corn. And, we always had dinner rolls served hot with margarine (oleo). Today, nutritionists recommend a smaller portion of protein—from one-fourth to one-third of the plate. This protein is to be low in fat like grilled fish or chicken. My doctor recommends eating only one serving of lean beef a week. A serving of starch (something high in fiber like brown rice, quinoa, or whole grain pasta) is to cover about a fourth of the plate, and the rest is to be filled with vegetables and fruit. I guess one could say we should live in a rainbow world: lots of greens, fruits of yellow, orange and red, colorful legumes, and brown starches. There is a campaign advocating Meatless Mondays, and eating a plant-based diet is growing some strong roots in the country. As my parents got older, they moved with the times and ate more whole foods and high fiber and lower fat options. In the 1990s scientist and researchers began studying the addictive nature of food. Up until that time, people who were compulsive binge eaters were proclaiming they felt addicted to certain processed foods like refined carbs (e.g., pretzels and Goldfish TM) and sugar (e.g., candy bars and ice cream). The problem was that these reports were only anecdotal, not empirical evidence. Since then researchers have conducted thousands of peer reviewed studies and meta-analysis of studies showing the addictive nature of food (Food Addiction Institute, 2015). Some studies (e.g., Nobel et al., 1994) discovered that many food addicts had the same D2 dopamine gene markers and reactions as those of alcoholics and drug addicts. And, other studies (e.g., Boston Children’s Hospital, 2013) revealed that obese folks produce opiates—a chemical found in man addictive drugs like heroin—when they eat a lot of refined carbohydrates and fat, including fast food (Garber & Lustig, 2011). This means they get high from these foods. One study demonstrated that overconsumption of fat stimulates further intake of fat. And, so the vicious cycle continues. Revisiting the way things were has helped me realize that my skewed relationship with food is due to both nurture and nature. Although I have not had a brain scan, I would bet my minivan that my brain produces opiates when I eat certain foods. I have a true chemical reaction to some things I eat. All that is nature—I was born this way. Moreover, I am someone who is easily overwhelmed and stressed, which also changes my chemical makeup and sends me running for a tub of Blue Bell Cookies and Cream ice cream. As a child, I literally stoked this conflagration with the food that was available to me and the choices I made. (Hum…Swiss Cake Rolls or green apple?) So, nurture played a precarious role in my food issues as well. Now that I am armed with this knowledge, I am going to investigate how I can help break this cycle. Stay tuned. Boston Children’s Hospital. (2013, June). “New brain imaging study provides support for the notion of food addiction.” ScienceDaily. 26. http://www.sciencedaily.com/releases/2013/06/130626153922.htm. Garber A.K., Lustig R.H. (2011). Is fast food addictive? Current Drug Abuse Reviews. Sep. 4(3): 146-62. Noble, et al, (1993). D2 Dopamine Receptor Gene and Obesity, International Journal of Eating Disorders, Volume 15, Number 3, April 1994. Warner, M. (2013). Pandora’s Lunchbox: How Processed Food Took Over the American Meal. Scribner. NY, NY. Awesome article Cara!! You could have been writing about my life! Puts lots of things into perspective.